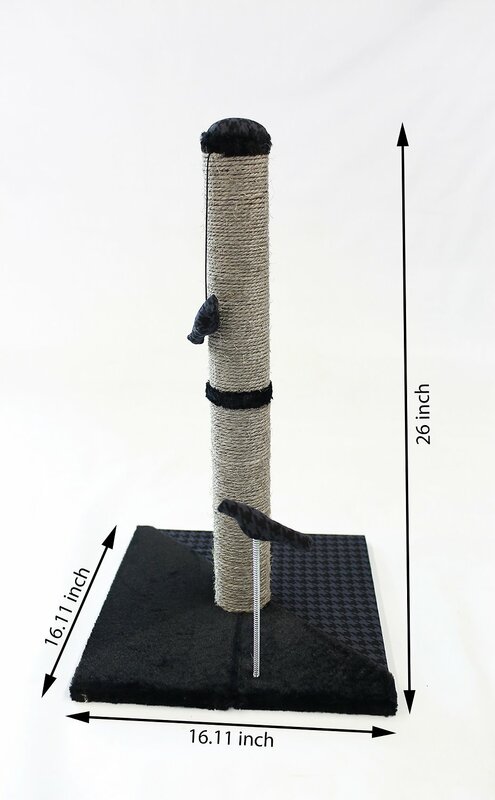 Show your kitty a scratching good time with Max & Marlow’s 26-inch Cat Scratching Post. 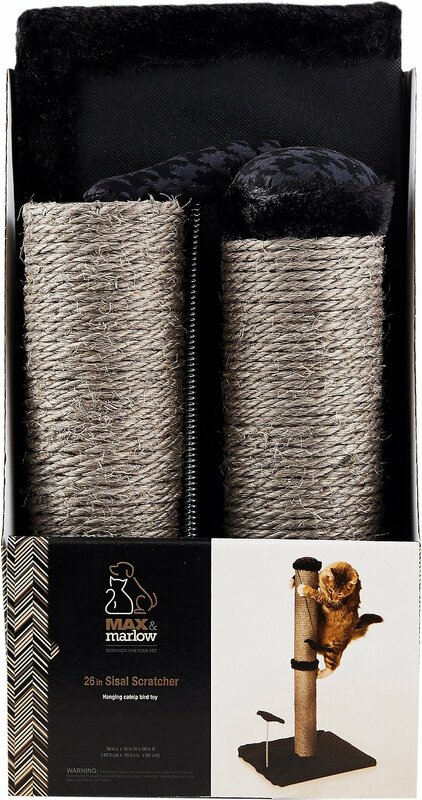 Made with roughly textured sisal, your kitty will love stretching their claws on this purr-fect post. 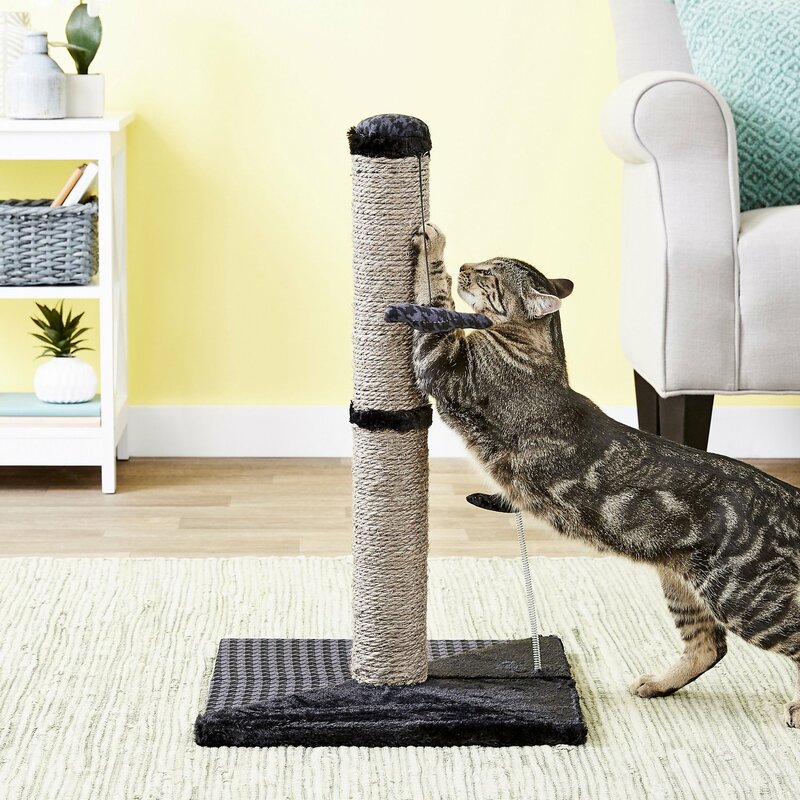 A sturdy carpeted base ensures this kitty scratcher will stay in place during intense play sessions. The soft plush carpet is easy on the paws and encourages appropriate clawing by providing your pet with a soft, comfortable place to relax. Your kitty will love lounging and basking on the plush base, while you’re sure to enjoy their frisky and adorable behavior! Made with natural, machine wound sisal for added durability and long-lasting wear. Easy to install tree can be assembled right out of the box without the need for tools or special equipment. 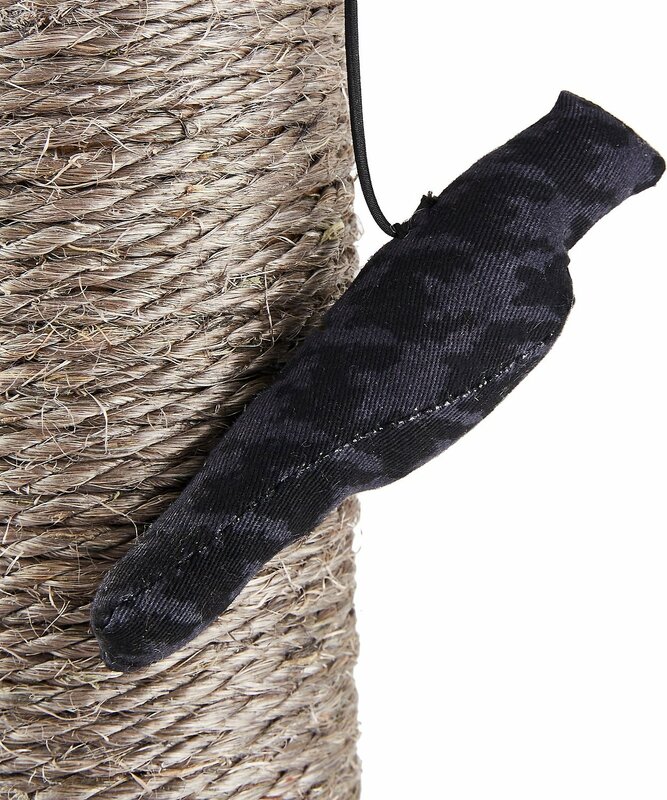 Encourages appropriate scratching and allows your cat to remove the dull nail sheath to reveal healthy paws. 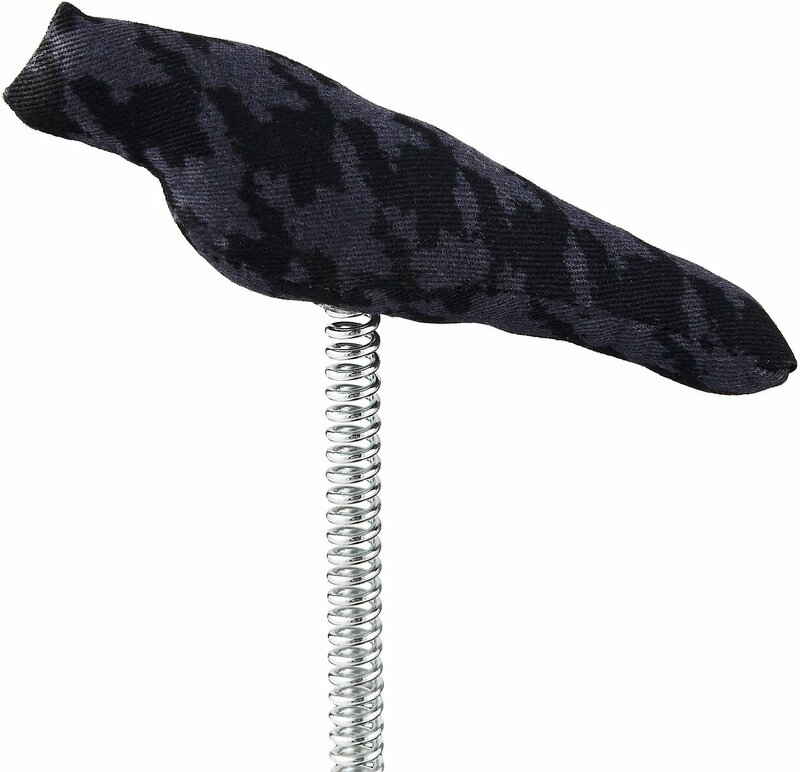 Includes a swinging toy to entice cats and encourage activity while reducing destructive behavior. The sturdy base is covered in soft plush carpet designed to provide your kitty with the perfect spot to lounge. I bought this for my two kitties about a year ago. It is the only post, including the ones on their cat trees, that hasn't frayed beyond repair!! It is sturdy when they use it. I am very satisfied with the quality of this scratching post. The size is perfect for both my little girl and big boy cat. I would definitely recommend it. My two 'fur-balls' took to this scratching post right out of the box. It is their favorite morning plaything - hanging off it and chasing the bird while scratching. It's a good, moderate size and very sturdy and the price was right. My cat is 12 years old, and has never had much interest in any scratchers we tried (he always preferred the couch...), UNTIL NOW. He LOVES this thing! So far it seems nice and study still, even with him standing up on his back legs and scratching from the top (he’s about 10lbs). He is obsessed with both of the toy birds attached to it. The string one is on an elastic string, providing amble entertainment. The only warning I would give is if your cat is larger/longer, it may be a little short for them. 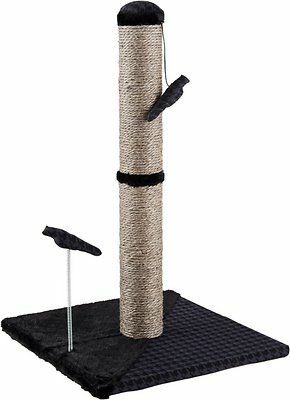 Over all, I would recommend this scratching post. I adopted Milo right before Christmas. He seemed to need something to scratch so I got this for his gift under the tree. He was rubbing all over it before my husband could get it together! He loves to stand up and stretch against door frames, but now he does all his stretching on his scratch tree. He is a pretty tall boy and it is a good height for him. Since he got this he hasn't scratched on my new furniture or my carpet like he was doing before Christmas. Best gift ever! This is a wonderful product. It is extremely well made (other than the top bird being pulled off it's anchor almost immediately, but I have reattached it). The best thing about this is how tall and stable it is. My cats can reach UP to scratch which they love. It has a strong heavy base which they can move around a bit, but it won't topple. They like to lay on it. I will probably buy another one. My two rambunctious kittens needed a taller scratching post so they could stretch up and get a good scratch in, and this post fit the bill perfectly! They loved it from the get-go, and have loved the two toys to death in the month and a half it's been set up. I tied a ribbon to the spring on the base and that keeps them entertained now. It's very sturdy, hasn't tipped over once in spite of their crazy antics, and is showing minimal wear other than the toys. Highly recommended! I've bought several of these and my cats have used them. They save the furniture and give cats a place to reduce their claws. 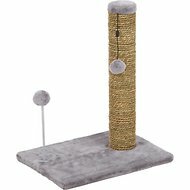 Sturdy scratcher my cats love! My cats liked this immediately. It seems very sturdy and I like the colors. Fits into my living room attractively. I have purchased 2 of these and all 3 of my cats use them. They are saving our couch and office chairs. The birds have gotten pulled off and apart but the scratcher itself still works well.